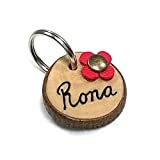 All dog tags engraved for pets are handmade of Spanish olive wood from the Spanish “Campo”. The name and number are engraved on the tag with a permanent marker. The double finishing is of a strong varnish. The tag comes with an Inox double ring. Engraving and finishing takes some time. We try to dispatch in 3 working days! WHO IS SUPERPIPAPO? -IN STYLE WITH YOUR PET! SUPERPIPAPO dot com designs and makes the Most Original and Highly Exclusive Custom Leather Collars for Dogs and Cats by hand! These can be combined with Matching Bracelets for their Owners! IN STYLE WITH YOUR PET – Truly unique! Look for Superpipapo Dot Com on the Internet or read the Seller Information! HOW TO FIND ALL MATCHING DESIGNS? Enter the NAME PART of the manufacturer reference of the product in the Amazon Search Engine Field “other products from this seller” in our Amazon Shop. The manufacturer reference can be found under technical details. E.g. reference is “rainbow-cgn”: enter “rainbow” into the search field. All matching designs will appear! For any doubts or questions please contact us! Many thanks and enjoy our unique offer! Greetings from Rikst and Jeroen – Superpipapo! Neck 30cm-40cm, Width 1.5cm, Size Small; The collar does not stretch itself, please make sure leave only 2 fingers between collar and dog neck. Since the reflective threads are stitched into the nylon webbing, it is normal to see that the reflective strings are frayed with the stiches where two layers of webbing are connected. The durability of this collar will not be affected. Please note that the reflective threads are stitched into the webbing on one side only. To keep the style and high quality, our designer delicately embedded part of the collar with 3M reflective materials. The metal D ring is black coated to add durability. All pictures are taken with our production samples from a size of Medium (Width 2cm, Neck 37 – 50cm); The collar is not made for the purpose of tie out. Please measure your pets carefully to make a safe and fit purchase. Always look at the size chart for the recommended weight range to confirm the size. 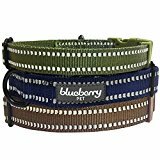 Motivated to keep your dog safe at night, Blueberry Pet’s reflective fashion dog collar is simply awesome for everyday use, every outdoor activity. This classy dog collar is made with reflective thread stitching to make sure that your pet is seen even during night time. Thus, pet parents will not worry about losing your loved pets. Your adorable friends will fall in love with this all-time favorite reflective collar, which offers great comfort and durability. With 3 trendy colors handpicked from our designer, we are proud to offer you the most classic reflective dog collar in Mahogany Brown, Light Navy, and Olive Green.